This episode sees us once again going back in time to 1916, and while we are there we are going to talk about the air war over the Western Front. The last time that we talked about the war in the air was way back in our 1915 episodes, which was still before the aircraft, pilots, and aerial tactics really came to maturity. Over the next 3 episodes, which promise to be very long, we will be discussing the era of greatest innovation during the war, 1916 and 1917. These two years would see the German, French, and British air forces take on a much larger role on the battlefield and begin a trend that would carry them to the end of the war. 1917 will be a particularly important year for the air war because it was in some ways the climax because it would be the point where three different trends would reach their peak. The first was the technological advancements, 1917 would see all of the air forces finally utilizing technologies like the synchronizing gear, more powerful engines, and far more maneuverable aircraft. The second was tactical advancements with moves away from single pilots or small groups wandering around the sky and instead focus on large groups of organized hunters. The third trend was the rise of many of the most famous pilots who would reach their peak in 1917. Some of the early pioneers would not make it to 1917, but in the last 18 months of the war the number of planes and engagements over the front would so drastically increase that the number of aces, and the scores of the highest killers, would dwarf those that came before. All of that is of course in 1917, and before we get there we have to talk about 1916 where all of these changes had their roots. Today we are going to break up our discussion into three parts, we are going to discuss German, then France, and then the British. Our discussion of the Brits will be a little light during this episode because the next one, episode 137, will be solely focused on the Battle of the Somme, which will of course provide the British with plenty of spotlight. The Germans started 1916 with probably the best fighter currently active in any air force, the Fokker Monoplane. This great airframe allowed them to maintain some form of aerial supremacy over the front, with many British and French reconnaissance flights falling prey to the Fokker. However, in this time of lightning fast innovation no airplane would stay at the top for long and by Spring 1916 the Fokker was beginning to show some signs of age and found itself outpaced by some new French and British planes that were arriving at the front. The first attempt to rectify this was to take the Fokker monoplane and turn it into a biplane, a reasonably easy change, but there was a problem, the resulting airframe was too stable. This is actually a problem that would be encountered by several airplanes during the war, and the concept of it is a bit counter-intuitive. When most people today are around planes they are using large passenger planes, which you want to be very stable for comfort and reliability. However, military aircraft are very different. The key with a fighter plane, especially these early types, is that you want to find a balance between stability and instability, because it is the instability that allows the plane to have the level of maneuverability required for dogfighting. If the plane is too stable then it can be very difficult to get it to do anything other than a dive or a slow turn, and of course in the dangerous skies of 1916 the pilots would need to be doing all kinds of quick turns and spins and dives to keep from getting killed. This instability can of course be taken too far, and if it is then the plane might just crash instantly, or be far too unsafe to fly, so the key was to find the right mixture which is something that would not always be easy. Even with the stability issues with the Fokker biplane it did not prevent the Germans from continuing to innovate, and in the summer of 1916 that led to the next great German fighter, the Albatros. The Albatros D1 and D2 would begin arriving at the front in late summer 1916, they were powered by a 160hp engine and they were sporting two machine guns, not only did it have all of the firepower of the two guns but they were also both synchronized to fire through the propellers, giving them a decided advantage over the Entente planes they would meet over the front. There was also another, far less obvious innovation in the Albatros, and that was its plywood construction. Up until this point most of the planes in the war were made out of normal hardwood, which had properties of normal wood like bending and warping. However, plywood could be created and molded in such a way as to provide far more strength. This made the air frames strong, but also made them lighter since far less material was required to achieve a stiffer airframe. The Germans apparently did not invent the use of plywood in airplanes, and instead borrowed it from the Russians who had been using it earlier in the war. The two Albatros' would be the primary workhorse for the Germans in late 1916 and 1917 but there were other planes in the air as well. Two of these, the Fokker E3 and E4, were the favorites of two of Germany's most gifted pilots, Max Immelmann and Oswald Boelcke, two men that we will discuss more of in a bit. Both of these models also had twin synchronized machine guns and the 160hp engine. They also had the unfortunate issue, especially in the E3 of occasionally getting their machine guns out of sync and shooting off their own propellers, which is something of a problem, but one that would be fixed with the E4. The E4 was something of a prototype in 1916 and was generally only given to the absolute best pilots like Boelcke and Immelmann while most other pilots would be placed into the Albatros. A critical piece of German Air strategy before the war had nothing to do with fighters though, and instead focused on airships. We discussed the airships in our previous episodes, especially their most famous bombing raids on London and other areas of Britain during the war, and while they were useful as a terror weapon in this capacity there were also several attempts to use them closer to the front. At Verdun it was hoped that they could go on nighttime bombing raids behind French lines, however the first few times that this was tried the raids were unsuccessful and further raids would be cancelled. This lackluster performance resulted in the airships being pulled from Western Front service. Overall, the zeppelins were a huge failure for the Germans because they were never able to find a way to use them that made up for all of the time and resources spent on maintaining and outfitting their zeppelin fleet. When Ludendorff and Hindenburg took over command in late 1916 the Zeppelins would be reduced in priority to the point that their primary role for the rest of the war would be as scouts for the High Seas Fleet. To keep planes coming to the front there were of course problems to be solved on the home front. The first of these problems was how the German aviation industry was organized on both a political and military level, a problem they would have to solve if they wanted to best utilize the resources available to them. Many of the problems in the aviation industry could be traced back to the fact that when the war started nobody had a large air force, and when the requirements at the front skyrocketed an entirely new set of command and control institutions had be created or organize and rationalize industrial output. The Germans had the additional problem of the fact that both the Navy and the Bavarian Army had their own air forces, which they were very adamant that they wanted to keep separate. The strain of Verdun and the Somme caused these desires to change and a new Command General of the Air Forces was named, General Ernst von Hoeppner. He would be in control of the entirety of Germany's air assets and would also oversea their growth and development. That growth was influenced by a memo written by Field Aviation Chief Lieth-Thompson entitled "The Expansion of the Flying Troops in Winter 1916/1917" in which Lieth-Thompson made the case that the Germans would have to find a way to be far more efficient in both their manufacturing and usage of planes at the front if they had any hope of combatting the obvious material superiority of the Entente. This was an astute observation, if maybe a bit obvious, but Leith-Thompsons push for efficiency would help drive the German air forces to try and make sure they were not wasting any planes that made it to the front, but ehy also had to make more planes, and that is where they ran into their second problem. When it came to increasing the production of aircraft the German government would spend the first three years of the war trying to wrangle and control the German aviation industry. One interesting piece of that puzzle, that John H. Morrow discusses in his work The Great War in the Air, is the role of patents in German aircraft production. Remember, all of these companies that were making planes were private organization, and they were in the industry to make money. In 1914 eight of this manufacturers agreed to let the military use some of their lesser patents for free but many major patents, and some very important ones, did not fall under this agreement. This would then lead to many more discussions over the coming years. In 1916 there would be 6 months of discussions in the Reichstag that eventually led to an agreement between the manufacturers and the government. The agreement was that any patent claims against the military would be waved as long as the following three conditions were met. The first condition was that if the military wanted to build a part, say at a workshop behind the front, which was under patent protection they would have to negotiate a special agreement with the patent holder. The second condition was that if another company wanted to make the part as part of military contract they could do some, but they would have to pay a fabrication fee. Finally, the 1914 agreement would continue to stand as negotiated at the time. While this got the ball rolling again, the War Ministry was already trying to find away around the whole situation by using their influence to just make sure that no new patents got issued for aircraft parts. This was particularly important due to the pace of technological advancement in the aviation industry where a plane built in 1915 may share almost nothing with a plan in 1917. While the patent issue was mostly solved, it was just one of the many issues that was being dealt with. There were also contracts, the constant struggle to get companies to work together as much as possible, and any number of administrative issues when it came to getting the manufacturers the raw materials that they needed. Even with all of these issues the Germans were progressing towards their goal of 1,000 planes a month in 1916. While this was sufficient by 1916 standards they would have to find a way to once again up their game in 1917. Before we move onto other countries, we should take briefly about German air tactics during 1916. The Germans, from 1916 on, would always be fighting against more planes than they themselves could produce. This forced them to try and use the planes that they had as efficiently as possible. The biggest of these changes, and probably the one that they are most known for, was the creation of the Jagdstaffel, or hunting groups. The creation of these groups, and the concentration of the planes within them went against previous tactics, where one plane or small groups would go out on patrol. While the creation of Jagdstaffel did not solve all of Germany's issues, it at the very least allowed them to fight back efficiently on the areas of the front where they were present. This reorganization was only possible because of a reorganization in the German command structure. Up until 1916 the flight units had been under the command of various Army Corps along the front, however as air combat became a larger and larger priority these units were moved up the chain of command, eventually finding their way to army headquarters. At these headquarters they were then given a Commanding General who would communication with air group officers at each Corps headquarters. They would then work together to use the available air units as efficiently as possible along the entire army's front. This increased structure allowed the Germans to utilize the planes that they had better, and also moved them around on larger areas of the front. In many ways the centralization of the command of the air force went along with a similar movement of artillery guns up to higher levels of command as both of these technological innovations had to be concentrated on a greater and greater scale. A conversation of the German Air forces in 1916 would not be complete without a discussion of their duo of famous aces of 1916. When the year started the two most famous aces in the Germany air force were Max Immelmann and Oswald Boelcke. On January 12th Boelcke was credited with his eighth victory, a number that Immelmann would make the very next day. These feats would then earn both of them the Pour Le Merite, the highest military honor in Germany. Many of you may now that on the scale of World War 1 aces, 8 victories is not very many, but this was at a very different time, many aces would rack up a ton of kills later, when there were simply far more aircraft in the sky to shoot down, and at the beginning of 1916 8 victories was a lot. Of course the two pilots were not done when they got their 8th victory and during 1916 their numbers would continue to rise, for awhile. Immelmann would be the first casualty on June 18th when his Fokker E3 was shot down and crashed. He would be credited with 16 kills before he died, and his death would have far reaching effects. Many German pilots saw him as invincible, and his death caused their morale to sink. The exact opposite happened on the British side, where their morale soared for the very same reason. Back at German high command, they saw what the death of Immelmann had done to their pilots and they decided that they could not let the same happen to Boelcke. He was therefore taken out of active service and sent on a tour of the home front. It would be during this time that he would create the training and tactical guidelines that would be the foundation of Germany air tactics for the rest of the war. Boelcke was very unhappy during his time away from the front and he would constantly push to go back, a battle that he would win in August. Late in that month he was sent back to the front and put in command of one of the Jagdstaffel. During his time leading the group he would meticulously train the other pilots with his new theories and practices, mostly around how they could work together. They would be the scourge of the air until October 28th, when Boelcke would collide with another aircraft while in pursuit of a British plane, he plane would hit the ground and kill him instantly. Both of these pilots, and their deaths, would be the end of an era for the German air forces. They had been the great stars of 1915 and 1916 and the last of the great German aces that flew most of their career in the early days of the war. But in their time they had started the German forces on their way to the future. Boelcke especially, through his training of his Jagdstaffel and his work on air combat theory would be the template of the greatest German aces of the last two years of the war. From the men under his command would rise his greatest pupil, Manfred von Richtofen, and man you probably know by his nickname, the Red Baron. But that is a story for another day. For the French the summer of 1916 was a tale of two different situations. For their fighters the summer of 1916 was a fantastic time as their Nieuport 17s outclassed anything that the Germans could throw against them, this was true even though the airplane did not use the synchronizing gear and was instead using the old system of Lewis guns mounted on top of the wing. In August the Spad 7 would make its debut at the front, and this would be one of the first aircraft to use the Hispano-Suiza engine and be armed with Vickers machine guns that could fire through the propeller. There would be a lot of issues with the Spad, which meant that widespread availability would not happen until early 1917, but it was definitely extremely capable. It was fortunate that the French had good aircraft ready to go for 1917 because their Nieuports were outclassed by the Albatros' when they started to arrive in large numbers. The other side of the coin was the bombers and observation planes. For these roles the French were still using the Voisins and Farmans that they had been using since early 1917 and the pace of evolution meant that these airframes were positively ancient by mid-1916. They were able to mitigate this problem a bit by switching all of their bombers to go out at night instead of during the day. This greatly reduced their bombing accuracy but saved planes and pilots. However, while the changeover to night operations helped the bombers it was not a strategy that could be used for observation planes. These slow and lumbering aircraft were easy prey for the German fighters if they were not heavily protected. This would be a problem for the entirety of 1916, all the way until the end of the year these same outdated aircraft were still arriving at the front to replace losses. This was a big damper for the French war effort because while the fighters got all the glory, and the bombers could hide in the night, the observation flights were crucial to the success of the infantry. They were the ones spotting for artillery, cataloging enemy positions, and finding the enemy guns. Each plan would have an observer, who was also an artillery officer, which meant that in observation units there were just as many artillery officers as there were pilots. These observation flights were further handicapped because the French High Command considered protection of observation flights to be a secondary objective for the fighters who were instead tasked with actively hunting for Germans. It was hoped that by hunting down the German fighters the observation planes would be free of trouble. This separation of concerns was exacerbated by who controlled the two groups of planes. The Fighters were controlled at an army group level while the observation planes were at the army level. This separation made coordination difficult and resulted in a lot of unprotected flights of the observation planes over German lines. Much like the Germans, the French would try and protect their fighters, and increase the efficiency of their fighters by grouping them together. This practice began during the actions at Verdun but would continue all along the front during the year. There was one big difference between what the French and Germans were doing in this grouping though. The Germans mostly spread out their best pilots, putting them with less experienced pilots to help them improve, the French did the opposite, grouping their best pilots into the same squadrons. This made these squadrons extremely capable but it reduced the average effectiveness of squadrons along the front. The French were also less effective at getting their best pilots to fly in these formations. You will still see French pilots fighting in the same lone hunter system that they had been using since the beginning of the war. Behind the front the government in Paris was struggling to optimize the French aviation industry. In an almost mirror image of the German issues the French government was trying to organize the aviation industry that did everything to resist central control. This began to slowly change when a man named Henri-Jacques Regnier was brought in to lead the effort. Regnier was an artilleryman by trade and the first thing he did was to create two new departments. One department was in charge of evaluating the planes at the front, then presenting those findings to the government. The other was in charge of organizing the procurement of new airframes in a more rational manner than what had been the practice before. While in some ways these organizational changes would begin to pay off quickly, with really good planes like the Spad 7 beginning to appear by the end of the year, it was not a total success. Almost immediately it became obvious that the French desperately needed a new bomber and observation plane. However, it was difficult to find manufacturers who wanted to try and produce them, with most opting to focus more on fighter production and development. The smaller and more glamorous planes had a higher rate of return for the manufacturers, and they were considered cutting edge which would mean more money in the future. Some of these problems, and successes, would set the French up for 1917, a topic for a later episode. Much like every other part of their armies the greatest test for the French and German air forces in 1916 would be Verdun. It would be here that the emphasis on fighters would reach new heights. The Germans had a huge initial advantage as they concentrated many of their planes to support the attack. These were used to create strong fighting patrols which tried to sweep the French from the air, which they were mostly success at. This then allowed their bombers to freely drop thousands of pounds of bombs on objectives behind the front and prevented the French from getting good intelligence about the German build up before the attack. Much like on the ground the French would respond to the German actions in the air with changes of their own. This came in the form of 15 elite squadrons which were dispatched to the Verdun front. These squadrons were then controlled at the highest level and were used strictly for specific operations designed to reduce the German advantage in the air. They would be organized in flights of 4 or 5 planes, although there would be a few that were smaller, and they would be facing German patrols that were typically 3 to 5 in number, which often gave the French the advantage. There would be a swing back in the German favor later when their Jagdstaffel began to arrive, with aces like Boelcke making their names over Verdun. While Verdun would set new milestones in terms of contributions from the air for an attack it would be eclipsed very soon by the attacks on the Somme. However, its role in cementing the importance of larger and larger groups of aircraft working together was important in the overall story of the war. When 1916 started, the British were perhaps in the worst spot in terms of airplanes on the Western Front. In 1915 they had taken a different approach to not having a synchronizing gear by building pusher aircraft. In a pusher the engine is mounted on the rear of the plane, with the propeller pushing instead of pulling the plane through the air. While this did allow a machine gun to be fitted to fire forward the performance of pusher aircraft would never keep up with similar aircraft with their propellers in the front, called tractor aircraft. There were several examples of the pusher planes in use during 1916 with the de Havilland DH2 and Vickers F.B5 being the most well known. As the year progressed these two planes became a greater and great liability. There were new types of planes arriving at the front, most in the biplane configuration with their Lewis guns mounted to the top wing. This allowed them to fire forward but also meant that it was difficult to reload the guns which was very important because the Lewis guns had quite limited drum magazines. To help with this problem the British created the Foster wing mount. This was a setup that allowed the pilot to pull his Lewis gun back and down toward him on a set of curved rails. This made it much easier to change drums and to fix jams, especially since the alternative was to stand up in the cockpit to reach up to manipulate the gun. While the Foster mount helped the Lewis Gun system would always be inferior and it would become a larger problem as the year progressed. This was of course due to better German planes arriving, but also because the altitudes in which the majority of operations were happening was continuing to increase due to the benefits of being higher than the enemy. By increasing the altitude the pilots were putting themselves and their machines in colder and colder temperatures. For the guns this presented some problems because the grease and oil that allowed the mechanisms of the guns to operate would begin to freeze at certain temperatures and the only way to fix this was to fire a few rounds through the gun occasionally, which meant they had to be reloaded more often and reduced the available, and already very limited, ammunition in the gun at any given time. 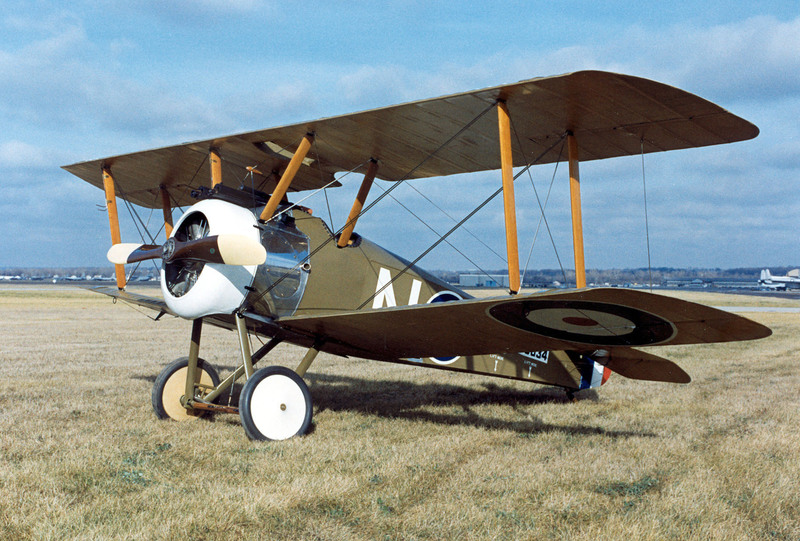 These problems would not be solved by the British until most of the way through the year, when the Sopwith 1 1/2 Strutter made its appearance in the fall, it would not arrive in great numbers until 1917. A discussion of the Royal Flying corps from 1916 onward cannot be completed without a discussion of their commander Brigadier General Hugh Trenchard. Trenchard first came onto the scene as a Lieutenant Colonel who worked with Haig during the Battle of Neuve Chapelle in early 1915. He was later named commander of the RFC in August 1915. The entire driving force behind the next 3 years of RFC tactics was the fact that Trenchard believed that the RFC existed solely to do what the army needed it to do. No matter how many losses it suffered, how many planes were shot down, how many pilots did not return, as long as they were doing their best to do what the army needed they were doing the right thing. When this belief was combined with Trenchard's obsession with push the RFC out over the Germans lines, and as deep behind them as possible, a lot of casualties would follow. Once they had penetrated deep behind the lines the British pilots were then told to seek out combat no matter the odds. This did mean that the German planes were often unable to get to the front, and it provided their observation aircraft some breathing space over the front which they needed in their slow airplanes, but it came as the cost of a lot of British pilots. Even the lucky pilots who were not killed outright would be taken prisoner. This is one advantage that the Germans would have over the British for most of the war. If a British plane broke down, even if the plane got to the ground the pilot would be taken prisoner, if a German plane broke down over their territory the pilot could be back up in the air the next day. With overall losses being so high, the ability of the British to train new pilots was critical. In Marked for Death The First War in the Air James Hamilton-Patterson would describe the RFC's training regimen as having three phases during the war. The first phase was general indifference as planes in the military were new and nobody knew what they were doing. The second phase was appallingly horrible, before the third phases during 1917 and 1918 during which they were just adequate. Since we are discussing 1916 we are squarely in that appalling phase. To showcase how bad the British training situation was, let's compare it to the French and German methods. In the French air force a pilot would go through a lengthy series of training to learn not just how to fly the plane but also a lot of theories and concepts around air combat. They would learn how the planes worked, how maintenance was done on them, how to best handle wind and weather. They were then taught how to properly navigate and how to deal with the unique torque of the modern rotary engines in use at the time. On the German side, they would send their pilots off to 6 months of training before they were even assigned to a squadron, at which point they would get even more training before seeing combat. For the British, well it was much less, some of the pilots would get about 1.5 hours of flying time in a two seat trainer, generally very old and very rickety and mostly just rated for level flight. Then they would be sent up by themselves for a few hours in a similarly old airplane that would not be able to do more than a gentle dive or a slow turn. They were then sent to the front barely knowing how to fly, let along how to fight. While this system may have been workable early in the war when combat was infrequent by 1916 it was pure homicide. The commanders at the front did not have a choice, and had to send up those who they had been given. These sometimes very green pilots would fight in the largest aerial battle in history in the summer of 1916 at a little place called the Somme. The story of the British, German, and French airmen on the Somme is a topic I have decided to devote an entire episode to, and it just so happens to be our next one. I hope you will join me for that episode, thank you for listening, and have a fantastic day.